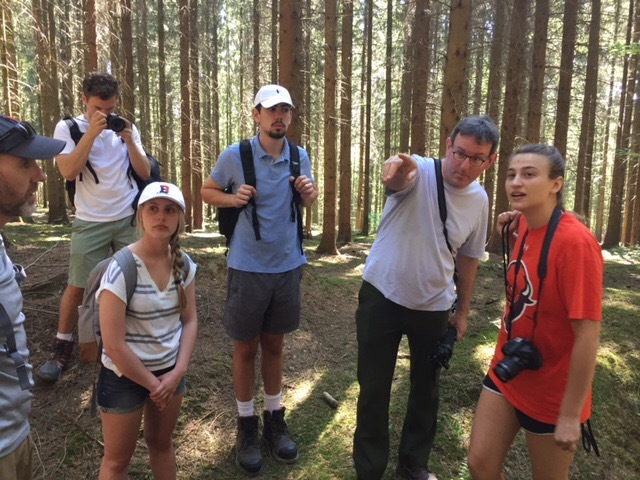 Today, in scorching heat, our team hiked approximately two miles to St. Hubert’s Pavilion in the Argonne Forest. This forest was the site of a major offensive for the American forces and one of Bucknell’s own, Dwite Schaffner, received the Medal of Honor there. The forest is still too dangerous to enter unless you stick to the designated paths because of the many grenades and artillery shells that remain in the ground nearly one hundred years later. Because of this, the forest is largely untouched and unused, giving it a uniquely tranquil quality. It is hard to imagine a large-scale loss of life in this intensely peaceful environment, but then it was not the same at the time of the fighting. Due to the heavy artillery shelling in the area, the trees were decimated and the ground was reshaped. The battlefield of the time shares little in common with the forest today in that sense. However, the trenches, though unused for nearly a century now, still form a maze through the forest’s ground, giving a bit of insight as to what the soldiers of the time were seeing. Seeing the effect that the war still has on this area nearly a century later is eye opening and upsetting. The forest has been reclaimed by the trees and mosses, but the trenches hold their ground and the artillery shells are too unsafe to ever remove. The Argonne Forest has healed, but it keeps its scars.